• Experience the Chadar trek on a short 5-day itinerary. 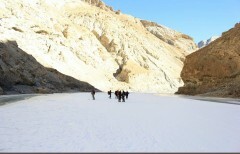 • Walk on a sheet of ice that blankets the Zanskar river. Today, you'll be driven from Leh to Shingra Yokma, stopping briefly at the confluence of the Zanskar and Indus rivers at Chilling. You'll disembark at Shingra Yokma and begin with a 3-4 hr trek to Bakula, your campsite for the day. Close to the campsite is the Bakula cave, where the namesake Buddhist monk and Indian ambassador to Mongolia used to meditate. The landscape is dramatic and stark, with weather-blackened trees and arid land. Overnight at Bakula in tents. After a night at the Bakula campsite, you'll make your way back to the start point of Shingra Yokma. The frozen river keeps melting and breaking the ice before freezing all over again. This ensures that although you've trekked over the route before, you'll be facing an entirely new terrain. At Shingra Yokma, there are vehicles waiting to take you back to Leh. Overnight at Leh in guesthouse. Land at Leh airport and report to a pre-arranged guesthouse at Leh. You'll be accommodated at Leh in guesthouse. Your rooms will have comfortable beds and blankets to ensure a restful night's sleep. Today's meal pacakge includes dinner only, but you can visit any of the restaurants in Leh to have meals at an additional cost. Acclimatize to the altitude and visit a hospital to get medical clearance. You'll be accommodated at Leh in the same guesthouse. Today's meal pacakge includes breakfast and dinner, but you can visit any of the restaurants in Leh to have meals at an additional cost. Overnight in Bakula in tents. After a short drive from Leh to Shingra Yokma, you'll trek to Bakula. You'll be accommodated at Bakula in tents, equipped with sleeping bags and mattresses. Today's meal package includes vegetarian meals of breakfast, lunch and dinner. Return back from Bakula to Shingra Yokma and drive to Leh. You'll be accommodated at Leh in a guesthouse. Today's meal package includes vegetarian meals of breakfast and dinner, but you can visit any of the restaurants in Leh to have meals at an additional cost. Check-out of the guesthouse at Leh and proceed to your next destination. Today's meal package includes breakfast only. Your trip ends here.